So using about $20 worth of materials from Home Depot I built 2 feeders that I believe will not let the food get wet from rain. The key piece is the roof flashing. Commonly 3″ PVC pipe is run up through the roof of a house to vent the waste line plumbing. So for a few dollars there is a rubber and plastic flashing the fits over the pipe that prevents rain from running down the outside of the pipe. 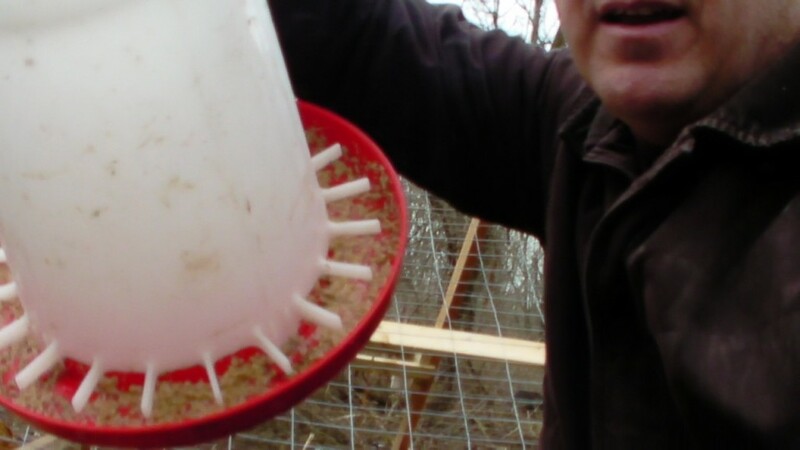 These serve as my method to keep water out of the feed while still leaving open the spot the chickens eat from. If these feeders were installed inside a coop they could be made for about $9.00 total. Cut 4-1/2′ off of the pipe. Cut 1″ off of the pipe. Make a 4″ cut lengthwise in the pipe and then cut off two 2″ rings that are split. Cut the remaining pipe to 4-1/2′. Use the 1″ ring to mark 2 circles in 3/4″ wood and cut out two wooden disks. On the 4-1/2′ pipes, measure up 9″ and cut a little less than 1/2 way through the pipe. This end is the bottom of the feeder. Heat the pipe just above the cut and fold it into the pipe. Make sure you do not completely block the pipe as this is where the food drops through. This forms the feeding station for the chickens. insert the wooden disk from the bottom stopping about 1″ below the cut. Slide the 2″ split ring you made up from the bottom stopping about 1/2″ above the cut. Slide the flashing on from the top stopping about 12″ above the cut. Slide a soup can on the top. Note I found this in my drafts folder, I actually did this about 3 years ago when I only had about a dozen birds. 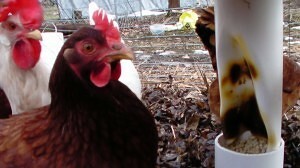 However I still use one of them for my oyster shell dispenser for the chickens.